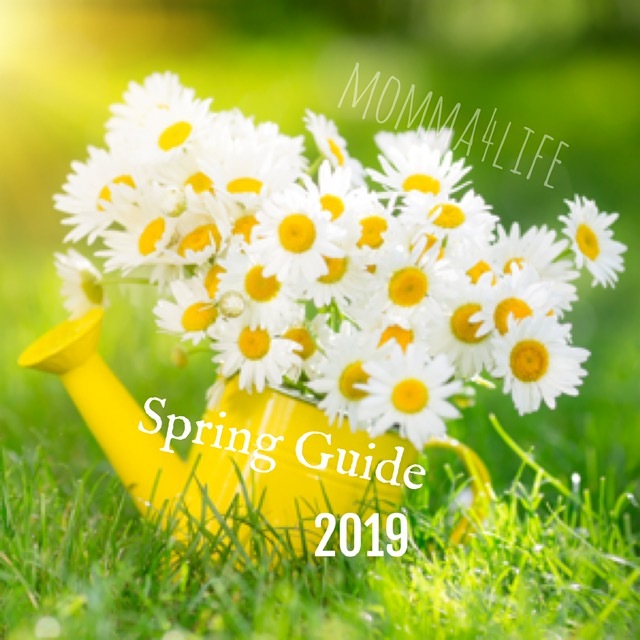 I am really excited to tell you about another company for my summer gift guide. 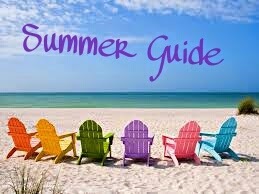 I love this time of year because I can tell you about all kinds of summer stuff that are really nice. 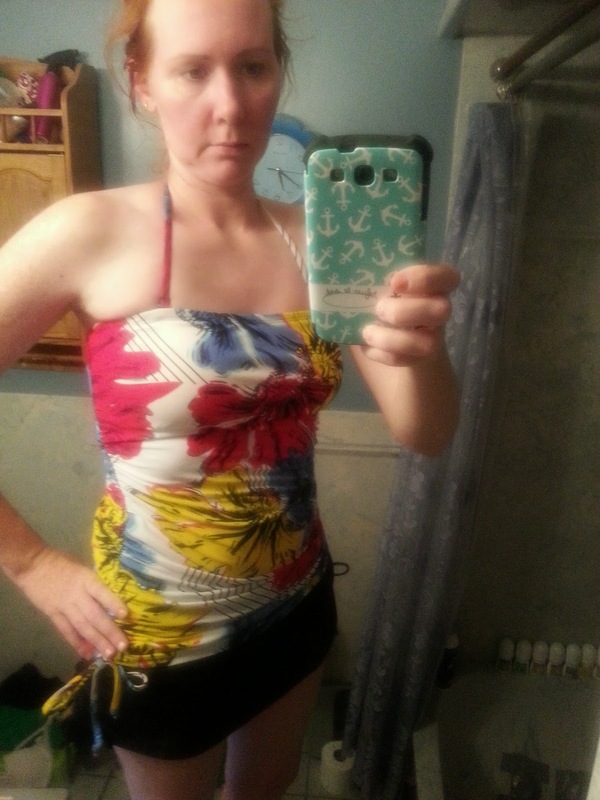 I love Hapari bathing suits they always have all the cute styles that you can mix and match together to personalize them to what you what. 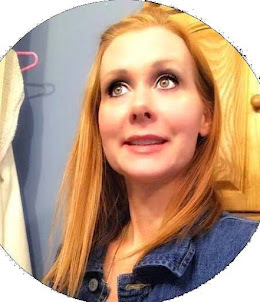 The suit I was able to review was the Eyelet Drawstring Top this is the closet I can find to this top not sure why they don't carry the original one I am wearing below. 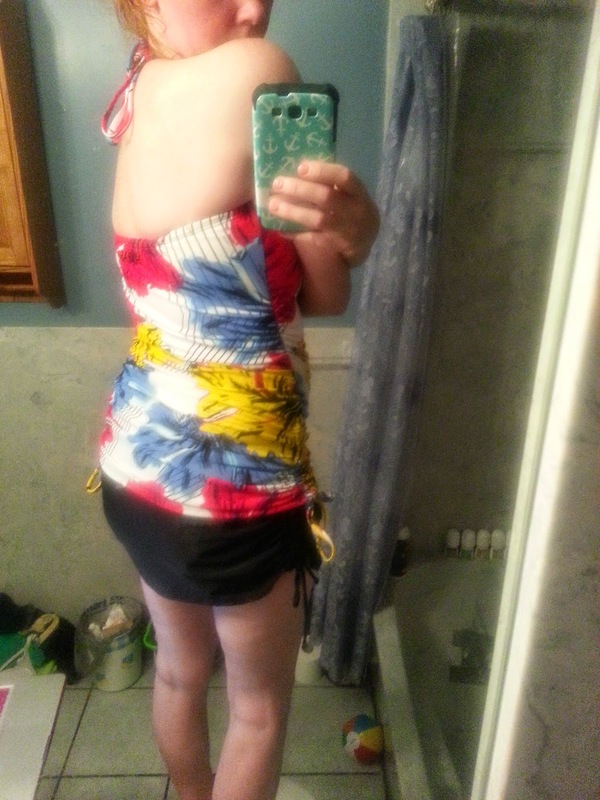 The only difference is that it's shorter and there is no drawstring bottom. And for the bottoms I choose the Black Drawstring Swim Skirt with Bottom these 2 pieces are so comfortable and feel amazing against the skin. Their suits are true to size at least in my case they fit perfect. I will definitely have to come back and look for more suits in the future. Our black drawstring skirt with swim bottoms is where sassy meets sophistication! Drawstring sides allow you to adjust the length of this skirt bottom for more or less coverage. This new skirt is a must-have from Hapari's 2014 collections. Mix and match with any Hapari top for a sophisticated beach style! Distinctive and beautiful, Hapari swimwear is designed to enhance a woman’s natural beauty – no matter her shape. At Hapari, we believe that every woman should look and feel great while having fun in the sun! And that is why our swimwear is created from the finest fabrics and with body-shaping features to help you feel comfortable and confident. Not all of us have the time to maintain a perfect figure, which is why we create swimwear to enhance the curves you love and downplay those you don’t. Nearly all of our bikinis, tankinis and one-piece suits are made with secret pockets sewn into the breast area that can be fitted with our Illusions™ silicone enhancements to supplement your curves. Our S.O.S.™ line of tankini tops feature the same gorgeous prints as our other suits, but are built with an underwire directly into the suit to give you added support where you need it most. When it comes to swimwear, so many women have trouble with their midsection. Hapari’s exclusive Tummy Tuk™ bottoms provide extra coverage and support for your waistline. And our selection of swimskirts, swimshorts, wraps and cover-ups provide additional coverage and protection from the sun. In addition, most tops in our line of tankini swimwear can be worn in three ways: halter-top, criss-cross back, or tank style. You have the option to choose which works best for you. You can also match any of our tankini or bikini tops with any of our bottoms, which means that you can design a one-of-a-kind swimsuit that fits your needs. And all our stunning swimwear is made to move. They look great and stay comfortably in place no matter what your activity. Hapari has come a long way since 2005 when we were founded by moms who took issue with traditional swimsuits. They thought women shouldn’t have to choose between the perfect style and the perfect fit. They decided to create a line of swimwear for real women that was fashionable as well as flattering. 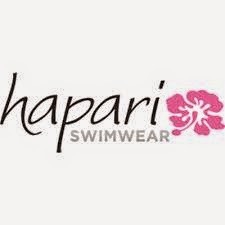 Though a lot has changed at Hapari since then, our commitment to providing stylish swimwear for all kinds of women hasn’t.